Slow cooked marinara sauce makes your house smell heavenly, and when it’s finally ready, it is truly bellissimo! As an Italian girl, I know sometimes great food takes a little extra time to prepare. But lucky you, you get to cheat a little with this recipe and simply plug in your crock pot. It will do most of the work while you get to take a bow at the end of the meal. I used my favorite canned tomato, San Marzano, for this recipe. You don’t have to, but any cook will tell you they’re the best. Why? Because they’re perfectly vine-ripened and come packed in pure tomato sauce instead of water. Well worth the extra cost in my opinion. But if you prefer fresh tomatoes, by all means, use them. You may need to add some tomato paste to thicken the sauce. I gotta tell you, my hubby is not a fan of meatballs. I know, he’s just weird. So when I said I was making this recipe, he just shrugged. I knew he was thinking who eats those little balls of meat anyway? Then he tasted them, and changed his opinion real fast. He loved them so much he had them for dinner last night, and again today for lunch. Need I say more? Another great idea for these is to serve them as appetizers at cocktail parties. Just make them a little smaller and stick those cute little toothpicks in them and your crowd will love them! OMG, yumminess plus here! They are by far the best meatballs I have ever tasted! When the meatballs are gone, I used any leftover sauce in my homemade spaghetti sauce…nothing gets wasted. Many thanks for making me a meatball lover! You are too kind! Thank you! (I’m sorry for the delayed response. Catching up. :) My husband said the same thing. He told me not to do crock pot meatballs, but I did anyway and now he’s on board. haha! Thank you for taking the time to let me know you enjoyed the recipe. Can I cook this on high at all. I got it cooking at 4pm. I’m sorry Tamara. I haven’t had that problem myself or heard of it from other readers. I wish I could tell you what went wrong. Rachel, I’m not sure. If you use a good quality meal and brown them before you add to the crockpot they shouldn’t be greasy. Any suggestions for making these egg free? I have dairy, wheat and egg sensitivities…this recipe hits the mark on 2 out of three and sounds delicious! Also, I’m planning a baby shower and would love to make these ahead of time (hopefully 2-3 days). Do you think I should cook them through and then just reheat them day of? Hi Kelli…sure just leave the egg out…it’s just used as a binder to hold the meatballs together, but they should keep their shape fairly well without. And yes, they should be fine to reheat and eat! These meat balls are to die for. I can’t wait to make them again. Jen, I’m so glad you like them. They are one of my favs too. I usually eat 2 or 3 before it’s even time to eat! :) Thank you! These look amazing and so worth trying tonight! Thank you! These were fantastic! Thinking of making them ahead and freezing. Do you think they would freeze well? It makes about 20 large meatballs. For appetizers I would suggest making them smaller so they aren’t too heavy for a toothpick if serving as apps. You could make the recipe as is or add a bit more meat for more meatballs. It makes a big batch. If I don’t have a crock pot can you give alternative directions please? Thanks! Laura, you can slow cook them in a big pot of low heat on the stove. They will be just fine. What would you recommend in place of almond flour? My boys are gluten free as well as peanut//tree nut free….. Thank you! Kim, you can just leave it out if you like. Other people have told me they have done this because of allergies and they still came out great. :) Or if you have a favorite gluten free/nut free bread you could use bread crumbs from that as well. I used coconut flour and it turned out magnifico!! I am so happy I found this recipe!! Your recipe for meatballs is closer to my grandmother’s (who was born and raised in Italy) recipe than any other recipe I’ve seen :) ….and you’re right, San Marzano tomatoes are the best….everyone in my family raves about them!! Thank you for posting…and I can’t wait to make these!! 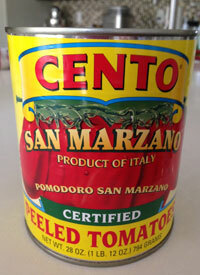 San Marzano tomatoes are not a brand but a type of tomato like roma or globe. Cento is the brand you are using. I didn’t count them, but probably about 18. I tried this with venison. I ended using 2/3 venison and 1/3 turkey. Overall, it was great – the sauce was delicious and I served of spaghetti squash. The meatballs were good but could use a little more moisture for this low fat meat version. Any suggestions? Thanks! Hi Christel, good questions. Since you’re using super lean meat it’s a little difficult. You might try adding some shredded zucchini or mushrooms to the meatball for moisture. If your looking for fat, maybe some coconut or olive oil? Maybe some of both (zucchini and oil) would be good? I’m not sure because honestly I don’t have a lot of experience with venison. Let me know how it goes. I saw a slow cooker meatball and marinara on Cook’s Country Kitchen-couldn’t get the recipe because they say it so fast and when I looked on the web page you were expected to sign-up for a magazine subscription – BUT, during the TV episode, they used shredded mozzarella cheese instead of bread crumbs – this was to hold the meatballs together and add moisture…give it a try. These were also some very large (about 2-3 inch meatballs). Do you know the calorie count for this recipe? I’m sorry, at this time I do not. In the future I may be adding them to my recipes. I love these meatballs! I eat them over spaghetti squash! Sooo yummy!! i just found your blog and your recipes are awesome … just pinned a ton of them! My non-Paleo husband is always asking me what kind of an Italian am I because I don’t eat pasta and bread but now with your recipes maybe I can go back to being an Italian again, only healthier! This recipe looks great. If I hadn’t just finished assembling your chili recipe for tomorrow’s dinner, this might have gone on the docket (the chili looks like it will be delicious, btw). Definitely saving this one for later, though. Great recipe. Just surprised you use canned tomatoes vs. tomatoes in a glass jar. This is my second time making these also. They are truly a delicious recipe…especially for someone who loved italian food and went paleo for better health. They truly do satisify my italian cravings and my husband loves them as well. Thank you Trina for a great idea and we will continue to enjoy.. I LOVE your blog and these recipe looks delicious! I’ve recently went Paleo doe to an anaylphalactic allergy to gluten and a growing sensitivity to other grains, and I love finding normal recipes that I know my family will love! Can’t wait to make these meatballs! Hi Patty, I’m glad you found us! I try hard to make the foods you’re used to, but changing them up paleo style. The meatballs are great and you would probably like the crockpot chili and chili lime pork. All easy, and comfort food. I hope all goes well for you. Paleo was a life changer for me, but in the best way! I can’t believe your husband doesn’t like Meatballs! Even my 5-year old loves meatballs! Who DOESN’T eat those little balls of meat? Lol. This looks like a fantastic recipe! I was curious what held them together if you weren’t allowed grains (crackers or bread crumbs). Didn’t think of almond flour! Bookmarking this for reference later! If you wouldn’t mind I would like to link this recipe in one of my future blog post. I love sharing new recipes when I find them…especially scrumptious ones made in crock pots. OH MY! These were SO yummy!!!! I can’t wait to make them again!!! Thank you for the recipes!! Do you have an alternative for almond flour for those allergic to nuts? Sun flour seed flour can work well. Just lightly pulse sunflower seeds in your food processor, careful not to over do it and turn it into sunflower butter. Or you can omit the flour all together. Is there an alternative to a different kind of flour to use in this recipe? My daughter has a food sensitivity to almonds.